From the 40 Days for Life Organizers: “Since 1997 in which Rockland County had 783 abortions, there has been a steady decline — with the exception of two years with a slight increase — and the abortion rate has fallen dramatically! Last recorded figure was for 2012, and the total number of abortions for Rockland were 351. Plans are underway for the 16th 40 Days for Life in Rockland. It will begin on February 18 (Ash Wednesday) and end on March 29 (Palm Sunday). 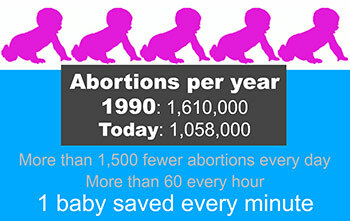 550,000 times in this new year, a woman will NOT have an abortion that would have occurred 25 years ago. That’s right: In 1990, there were 1,610,000 abortions in the United States. Today, there are about 1,058,000 each year. Both are tragic statistics. But the newer number represents 1,500 innocent baby girls and boys saved from abortion each and every day. More than 60 saved every hour. A baby saved every minute! This entry was posted in 40 Days of Life by rocklandrtl. Bookmark the permalink.